Learn French in Biarritz at our partner French language school, France Langue-BLS. The language school is fantastically situated in the city centre, within walking distance from the sea (10 minutes). 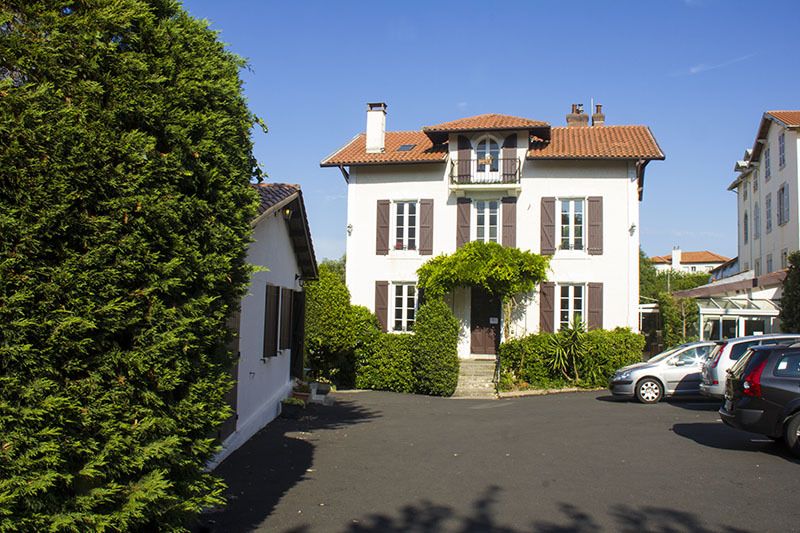 France Langue-BLS is located in a typical Basque building from 1850 and is the ideal location to learn French. The language school is at a 5 minute walk from the lively neighborhood 'Halles' where you can find many restaurants, shops, bars and markets. The intensive course offers 20 or 26 hours of French lessons per week. The courses are suitable for all levels. The courses start every Monday and last from 1 week to 48 weeks. If you are a complete beginner, there are specific starting dates for the course (please see below). The surcharges for half board in a host family may differ according the period of the year; in the price quotation online, the board supplement valid for high season will be applied (02/06/2019–31/08/2019). If you book accommodation in low season, the surcharges for half board will be lower and this will be adjusted on the invoice accordingly. It is possible to stay with a host family in the city centre or with a family with private bathroom (executive host family). Prices on request. Students under 18 years have to book a double room in high season. A twin/double room for 18+ students is only available for students traveling together. Arrival: Sunday before the course starts. For arrivals before 14:00 hours, an early check-in fee of € 35,- will be charged. Special dietary requirements: prices host family on request. Minimum age to stay with a host family is 17 years. The price quote reflects the highest surcharge (based on a stay of more than 6 weeks and in the high season). Stays of 6 weeks or less and outside of the high season apply lower surcharges, the correct surcharges will be applied on your invoice. This price is for a transfer on arrival at the airport or train station of Biarritz. San Sebastian airport € 110,- p.p. Bilbao airport: € 300,- p.p. Bordeaux airport: € 370,- p.p. Please indicate on the booking form at which airport you will arrive. In 2019 the school is closed on: 01/01/2019-06/01/2019, 22/04/2019, 01/05/2019, 08/05/2019, 30/05/2019, 10/06/2019, 15/08/2019, 01/11/2019, 11/11/2019, 21/12/2019 - 05/01/2020. For group classes missed due to a bank holiday, students will get a refund (please contact us). The combined course is specially designed for those participants who would like to study in a group, yet at the same time have some private lessons for their professional or personal needs. 20 group lessons + 6 individual lessons per week. You can start this course any Monday of the year for less duration. However, bear in mind that we can’t guarantee that you can take the official exam at the end of the course, since this depends on the exact dates and level you wish to prepare for (see official exam dates per year under the price table). Please always contact StudyTravel in order to see whether the course of your choice enables you to take the exam at the end of your stay or have a look at the recommended starting dates below. Registration for the DELF/DALF exam should be done 4 weeks in advance and exam fees are not included in the price. This course with 20 or 26 lessons per week is open to all levels and is part of a continuous improvement process of 25 or 36 weeks. With daily classes, you immerse yourself in the French language and culture so that you can quickly acquire fluency in spoken and written French. This will allow you to easily integrate in the workplace, prepare French exams such as DELF or DALF, or open the door to higher education. The general French courses are based on an interactive and progressive teaching methodology, focusing on reviewing and deepening the grammar, vocabulary, pronunciation, written and oral expression as well as listening skills. With the course of 26 lessons, you can personalize your course thanks to in-depth linguistics and cultural modules. The course French&Golf combines 20 lessons French per week with 5 golf lessons per week (1 golf lesson=2 hours). The golf programme takes place at the Golf of Ilbaritz, a magnificient 9 hole course situated in an exceptional setting between sea and mountain. Your training programme is personalised and takes into account your ability and objectives. It is aimed at people of all golfing levels. You will receive 4 lessons French in the mornings and 1 lesson golf in the afternoon every day from Monday to Friday. The prices of the course Language & Golf include the use of the material. The French language and surfing course consists of 20 morning French lessons from Monday to Friday + 5 lessons of surfing in the afternoon at "La Côte des Basques". The prices of the course Language & Surf include the use of the material. The minimum amount of participants is 3 from November until March. The one-to-one course is perfect for those who want to optimise their study time. The aim of the one-to-one course program is to offer a fully personalised method of teaching designed to meet your specific needs and desires. As the classes are private, you will be able to decide the schedule and content. 15 or 20 lessons per week. As a parent, you will attend the general intensive course of 20 lessons per week (in groups of mixed ages and different nationalities). The course is suitable for all levels and you will be placed in a group according to your level of French. Lessons take place in the mornings, which enables families to enjoy their afternoon together with their kids. The Family course for children aged 14-17 consists of 20 lessons French per week with special emphasis on communication. During these lessons, teenagers will develop essential language skills (speaking, writing, listening and reading) through full immersion and communicative lessons. Please note: if you book the option without accommodation, only lessons will be included, no activities in the afternoon! Surf lessons will take place in Plage des Corsaires (return transportation is included) and these will be taught by professional monitors. Wetsuit and board are provided. Multi-activities consist of 4 different sports activities in a group size is a maximum of 12 people. The sport activities include climbing, rafting, volleyball, sea kayaking, golf and horse riding. Minimum age is 14 years . During your language course in Biarritz you will live with a real French family. You will stay in a single room with bed and breakfast, half board or full board. If you do not book any meals, you are allowed to use the kitchen of the family. Students in the age between 16-19 years are always staying in a twin room in a host family with half board or full board. If you prefer to have privacy, you can stay in a studio during the course. There are studios for one and for two persons. The studios are located in the same street as the school. The studios are fully furnished and have the following facilities: TV, wifi, a small fully equipped kitchen (except dishwasher), bathroom with shower and toilet, hairdryer, iron and ironing board, terrace and veranda. You can make use of the pool (from June - September) and there is paid parking available. Change of bed linen every Saturday.